I'm sure it's a grand old life being Zack Snyder, aka Hollywood's Worst Auteur (HWA). He might be among my all-time least favourite directors, but in a very limited sense I kind of respect him. The HWA has achieved an enviable position - happily deflecting the vocal criticism of his work as he's consistently granted the hottest properties and healthy creative control (after all, few of Hollywood's other worst auteurs are granted the freedom to make films like Sucker Punch). And, in fairness to the HWA, he's more than a mere hack - his films are his own, his style absolutely distinctive, and his body of work is constantly exploring similar themes & ideas, ensuring his filmography is the work of a singular auteur rather than your average 'filmmaker for hire' even when the results tend to be absolutely awful. Like pretty much all his films thus far (Dawn of the Dead excepted, his sole mostly successful effort), Man of Steel is not quite your average blockbuster - instead it's this weird mix of uniqueness, familiarity and pretension. It doesn't work, not by a long shot. The latest attempt to rejuvenate the cinematic career of Superman has many crippling problems, the most significant being that it treats pulp material like its a Bergman, Ozu or Malick, while only being fleetingly aware of how absurd it inherently is. It makes this abundantly career during its extended prologue on Krypton, presenting unimaginative, silly space opera with a militantly po-face. The fiction establishes a drained, hollow world - and if the filmmakers' intentions were to create a lifeless, unbelievable, generic CGI world to reflect this, they have succeeded. Every line of dialogue from Supe's father Jor-El (Russell Crowe, consistently poorly served by the film's most unutterable lines), General Zod (Michael Shannon, the film's strongest screen presence but unfortunately operating on a different level of self-aware high pantomime to the rest of the cast) and all the rest are not the credible interactions of alien beings, let alone humanoid ones. People - human or extraterrestrial - do not speak to each other in this film - they merely open their mouths to express whatever clunky, ridiculous exposition is required to propel the film's wafer-thin plot or characterisation forward. That, or shout 'NNNOOOOO!' with great gusto. The prologue's excessive, sterile big-budget sci-fi (and we're to return to Kryptonian architecture & technology before the credits roll) plants us firmly in The Phantom Menace territory, and it's unfortunately an indicator of things to come. Indeed, in defense of Mr. Snyder, David S. Goyer's script is perhaps the film's weakest link - a plodding mess from the man who helped us believe superhero films could be taken seriously in the infinitely superior Dark Knight trilogy, which this film tries to ape with very little success. Despite a relatively clever and fluid structure - the first chronological jump is the closest thing the film offers to a spine-tingling moment - the writing is constantly held back by its familiarity, laziness and fortune cookie psychology. No characters or relationships are given space to establish themselves, ensuring emotional payoffs ring hollow at best, completely unconvincing at best. Which brings us to another foundational misjudgement - the film's aggressive, awe-struck melodrama. This is a film that actively mistrusts the audience, confident that we will not understand what is happening unless it is presented in the most dramatic of contexts and explained to us in no uncertain terms. Tied with the aforementioned emotional vapidity, this ensures the film's self-seriousness is impossible to take seriously. Take, for example, a pivotal event in the Superman mythology - the death of the hero's adopted father Jonathan Kent (here played by Kevin Costner - trying hard but restricted by the philosophical emptiness applied to every speech he's required to give). Snyder and Goyer choose to frame the scene against a raging but shoddily rendered CGI tornado, ensuring an artificiality even before the cheesy, illogical and improbably contrived dramatics neuter the attempts at poignancy. The only response I found appropriate was to giggle. It's a trend that recurs throughout the film - the creatives more-or-less constantly vetoing quiet, reflective moments when there's epic melodrama to be had. And, alas, the rare quiet moments are even more rarely well-handled (kudos, though, to one or two scenes that very briefly comment on some of the more ridiculous inconsistencies like the iconic 'S'). It's exhausting, and not helped by a violently and obnoxiously insistent Hans Zimmer score - the compositions themselves may be perfectly grand, but here, at such length, they merely add to the relentlessness. If the strings are constantly soaring, we must surely feel excited - again, the film telling us what to think rather than trusting us to make up our own mind. All this for an overfamiliar myth - although the redundant retelling a well-worn story is, as you might have gathered, is far down this film's list of flaws. Clark Kent's journey of self-discovery is equal parts confused and familiar, transplanting Batman Begins' journey onto a fundamentally different character. In Nolan's world, all the elements came together to conjure a convincingly brooding revision of an origin story with actual themes and well-defined characters. Here, it never gels together - the attempts at realism jarring badly with the OTT comic-book fantasy. I'd never demand a return to Richard Pryor wackiness or straight-up irreverence, but altogether this seems like an attempt to marry a style with an incompatible franchise, seemingly forgetting that seriousness demands substance. Subtlety is a concept foreign to Man of Steel - although admittedly subtlety is hardly an asset we associate with a borderline invincible hero. But Snyder directs with such awe, such force that he treats fantastical material with almost biblical reverence. Alas, instead of convincing us with his preaching, he merely invites further ridicule. Superman has always offered a Christ-like subtext (and plenty of crucifixion-esque posing here, not to mention the frequent allusions to God). But Snyder dismisses the 'sub' by having Kent literally sit in front of a stained-glass portrait of Jesus for a full thirty seconds. The Sun might be an integral force in establishing Superman's superness, but Snyder radically overstresses this by having every other shot dramatically pointed towards the star, leading to off-the-chart level of lens flair and glare - an act of accidental self sabotage even J.J. Abrams would surely think is a bit much. A neat trick once, not so much the hundredth time around. The mantra of Man of Steel is why hint when you can insist, and insist at great length. Visually the film is wildly uneven - it travels from drifty, Malickian handheld to Michael Bay levels of bland hyperactivity, and everything in between. Individual images may be momentarily appealing (ferocious editing, of course, denying us the chance to soak them in), but a coherent vision never emerges. The film's main visual signatures are its repetitive, silly sun worship and fondness for having the lad o' steel pose grandiosely. Snyder is no doubt a unique, careful stylist, but that style is one that's empty, shallow and confused (and, in moments such as the farcically pointless appearance of a giant whale, straight-up laughable). So much of it is computer-generated to within an inch of its life - you'll struggle to believe a man can fly even with the aid of tens of millions poured into an SFX budget that chooses quantity over quality. This is trailer-length filmmaking stretched to feature-length - no coincidence the teasers are more satisfying than the whole. Henry Cavill as Kent, meanwhile, makes for a schizophrenic protagonist - inwardly brooding one moment, charismatically wisecracking the next, with the jarring personality jumps never credible. His chemistry with Amy Adams' Lois Lane is non-existent - their blossoming romance only existing because the mythology demands it, the actors never selling their connection. Everything, with dulling inevitability, leads to over an hour of noisy, incoherent destruction: the Third Act syndrome that has become the greatest threat to blockbuster form in the last decade. Here, the comparison is less George Lucas and more Transformers or The Matrix Revolution - the blandest, dullest setpieces that manage to dull despite the fact people are being punched through buildings every couple of seconds. There's even a wealth of military cutaways and subplots, that laziest of all Michael Bay approved filler material (not that this 140 minute monstrosity needs the extra content). The role of Superman - allegedly the great protector of civilians - is almost forgotten in the mindless murder and collateral damage that seems to result in half of Metropolis torn to shreds. The memory of early scenes of the brave, considerate hero have all but evaporated in favour of a grand old grudge match. There's some contemplative epilogues that bring this Superman in line with the classic incarnation, but they couldn't possibly earn my interest after the dulling greyscale mayhem. All that, and I haven't even mentioned the film's internal logic and consistency seem to shift and swerve at every available opportunity. 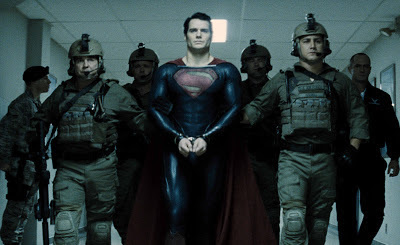 Man of Steel, then, is self-serious in its ridiculousness, adolescent in its thematic and character concerns, unimaginative in its storytelling and staging of action - very much the product of Hollywood's Worst Auteur, then, because those things are exactly what he does. Some will love its passionate attempts to revive a superhero with cinema in his blood. Personally, I felt it was an exercise in the gravest, most appalling excesses - at the very least, that differentiates if from a mere mediocrity, but the cost is simply too great to bear.